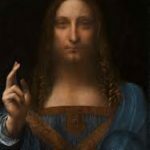 The Friday File: Earlier this week, the “Salvator Mundi” by Da Vinci sold at auction for $400 million, $450 million including fees. This shatters the prior auction price high of $179 million set in 2015 for Picaso’s “Les Femmes d’Alger”, and the all-time high of $300 million for works by Cezanne at private sales. In 1958, “Salvator Mundi” sold for $125 before it was determined to be a Da Vinci.